Ichiro's Japanese career started back when I was in high school. And while I was in college and not paying attention, he snuck across the Pacific Ocean and made a big splash in Seattle. I returned to the hobby to be introduced to him and Albert Pujols. Both would eventually become players I highly respected not just for their performance but also for their dedication to their craft. In person, I saw him play twice, both with the Mariners, before I came to Japan. And while newer stars like Darvish, Tanaka, and Ohtani have been mentioned by my students, the most common favorite player I hear over here is Ichiro. And while I've been here, I've managed to pick up some pretty amazing Ichiro cards. I have two copies of his BBM rookie card - one for my player collection and another for my 1993 set. I have the rest of his regular issue BBM cards, as well. What I don't have are his Calbee cards, sadly. I've found bobbleheads, figurines, hand fans, and I even picked up a game model Mariners jersey several years ago after he defected to New York. Just this week, I managed to complete my Ichiro collection. It's not the best cut, but I am very happy to finally add this to my collection. It's fitting that my collection would be complete at the same time his career is. Ichiro didn't get to go out with a bang - no final trot around the bases, or even beating out an infield hit. But he did get to finish in the same place he started. I wish I could have been at that game. Ichiro spent nine seasons in Japan, all with the Blue Wave, before coming to Japan in 2001. In Japan, he batted .353, with 1278 hits, 118 home runs, 529 RBI, and 199 stolen bases. His MLB batting average, over about 18 seasons, was .311, with 3089 hits, 117 home runs, 780 RBI, and 509 stolen bases. With the NPB, he was a seven-time All Star, in the US, ten times. He won the Pacific League MVP three times, and won the AL MVP and Rookie of the Year awards in 2001. He won seven Golden Glove awards here in Japan, ten in the US. 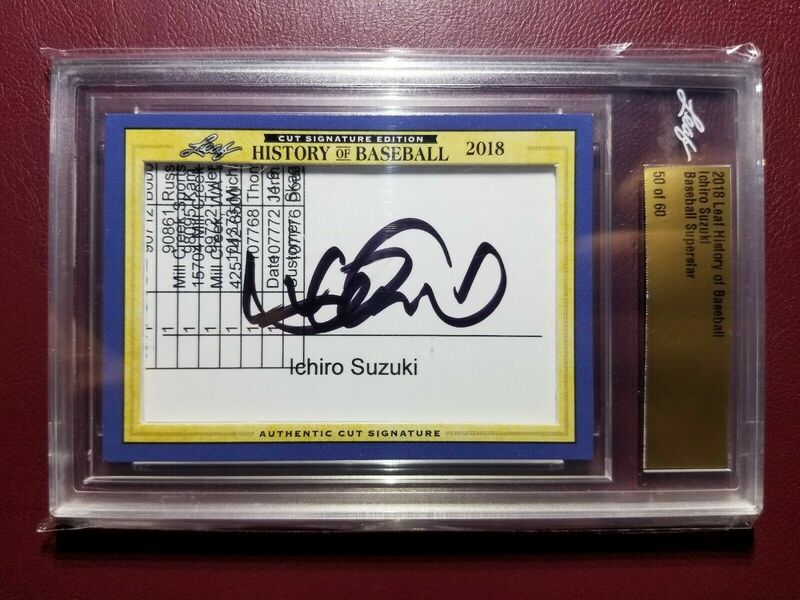 He holds the following MLB records: 262 hits in a single season, 10 consecutive 200-hit seasons, most hits by a Japanese-born player, most hits in interleague play, and most hits in a season by a rookie. Combined between the two major leagues, Ichiro has 4367 hits, which makes him the professional all-time hits leader. In the MLB alone, over his 18 seasons, he places 22nd. As a side note, we could also discuss Sadaharu Oh and Josh Gibson as major league home run kings at this point. But we won't. He had great speed. His 509 stolen bases ties him for 35th all time. Tack on 199 more from the NPB, and he's at number 11. He had a great arm and his Golden Glove awards in both leagues attest to his prowess in the field. Ichiro didn't just play well, though. He really opened the door to Japanese players, and showed that you don't have to hit home runs to be a star. I can't wait to find the next Ichiro, if there is one. Long time no see - nearly a month. Once again I've found myself to be quite busy. I'm living on the road during the week, and while I have a comfortable apartment, it makes handling my cards, scans, and posts challenging. I actually haven't been that busy at work, but I can't just bring my laptop into the office and whip up a post or two. And it's not that easy to transport a laptop back and forth every weekend just to write a few posts... if I have time. In a couple of my discussion classes this week, we talked about ghosting. And it seems that I have a horrible habit of ghosting - on this blog and via emails and other communication. It's not that I want to break off our relationship, it's just that I have too many things going on sometimes! Today's card is appropriate, as I waited for quite some time for this one. This black autograph of Molly McGrath from 2018 Allen & Ginter took forever to get here. I'm not sure what Molly was doing, and I'm sure as a sportscaster she's busy traveling to sporting events. I got a good deal on the redemption card, and I just had to wait for Topps to finally get the cards back and forward this one on to me. The one good thing about redemption cards is that Topps will ship them to Japan for free! I've never seen McGrath on TV... or anywhere other than A&G, since she doesn't do baseball. But maybe some day she'll do some meaningful broadcasting? She's from San Francisco, though - my home town!